3-5-2? 4-3-1-2? Biscotto? Those were the questions oppressing Italy coach Cesare Prandelli, his players, punditry, and fans before Italy's critical game against the Republic of Ireland. But it was Prandelli who somewhat accurately described what was the most significant reason for Italy to go through to the quarterfinals. "Today we understood that determination made the difference, and not just our quality," said the coach in the post-match conference, the tension slowly dissipating from him after what he called the toughest game of his managerial career. In fact, Italy's quality was a rare sight yesterday, rarer than against Spain and Croatia, and even their determination, at times, threatened to veer into panic, as the players started to look at the clock well before full-time. 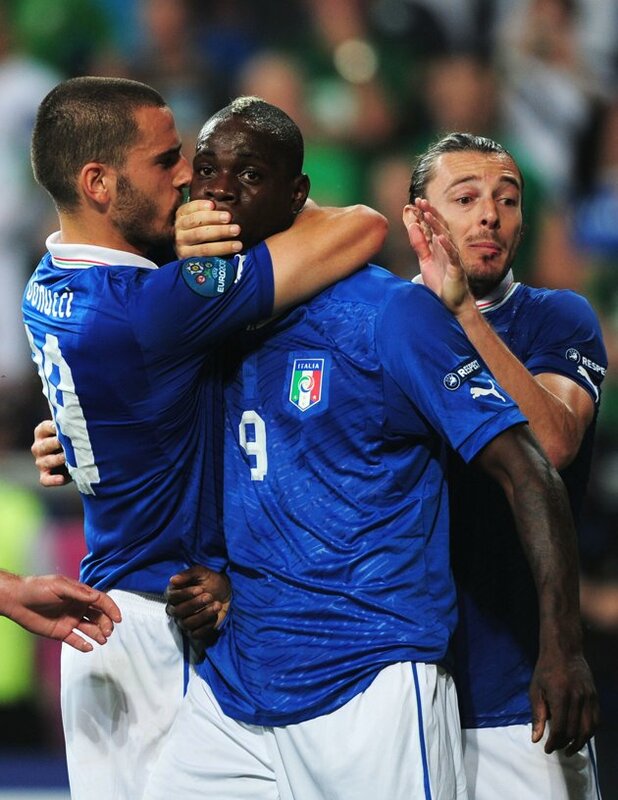 It wasn't until Mario Balotelli's absolutely staggering goal to make it 2-0 that Italy exhaled. Well no, that's not entirely true. They had to wait for news to filter in from the other game between Spain and Croatia, which the former won, before they could fully let go and exult. The victory yesterday was Italy's first at a major tournament since their 2-0 defeat of France in Euro2008, and it came after football that was less than convincing. But this has been typically the case with Italy in decisive group games in recent memory (World Cup 2002, Euro2004), and yesterday, too, there was the customary drama that accompanied Italy's final group game. 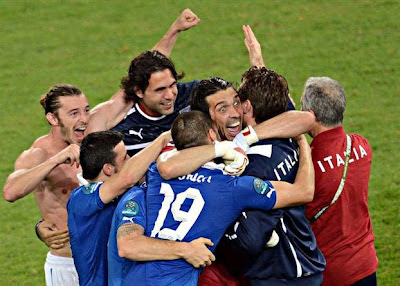 Most important, however, is to understand that Italy have shown a distinct struggle for consistency and identity during their first three games at Euro2012. Against Spain, Italy were convincing for the most part, against Croatia they were tired, and against Ireland they were nervous. The only palpable thread uniting all three performances has been the quality of Andrea Pirlo, who should be wrapped in the softest silk if Italy are to have a hope in this tournament. His feet have been poetic even at 33. He described yesterday's game as one of his "worst," but even then it was he who set up Antonio Cassano's goal, and it was he who calibrated, admittedly only at times and not as effectively as in the other two games, the pace of the game according to his mood. Daniele De Rossi was solid all three games too, but further up the field Italy still have to discover their best combination. Playing Thiago Motta behind the strikers in a 4-3-1-2 was not extremely effective, and it is still unclear whether Prandelli will start with Antonio Di Natale, who had a decent game, or Balotelli. I would guess Balotelli will start the next game. Remember, too, that Fabio Borini has also not seen playing time yet, but perhaps he will have to be content on the bench. Lest we forget, of course, there is also the constant question of whether to play three or four at the back. Italy don't seem to have the fitness levels for the former option, and with Giorgio Chiellini potentially injured for a couple of games, it seems four at the back may be the way to go forward (figuratively and literally), not least to include Federico Balzaretti, who was impressive last night. All things considered, I am optimistic. I think as cliche as it is, I agree with Claudio Marchisio when he says that "Italy's tournament starts now." Italy will play one of France, England, and Ukraine next (most probably France), and there will be a need to impose themselves on their opponents. That means Cassano has to do even more than he has, and Balotelli needs to understand--really, understand--that his superb technique, on display in full technicolour yesterday, is the precise genius that Italy are craving (incidentally, Leonardo Bonucci's muzzling of Balotelli after the latter's goal was the most endearing moment of the tournament thus far). This Italy can reach the Final, as Marco Tardelli and Giovanni Trapattoni said yesterday. Prandelli also concurred, though he didn't put it as confidently in the affirmative. "Now, nothing can be excluded," Prandelli has been quoted as saying by Tuttosport. On the balance of the three games the optimism may seem misplaced, but Italy are soaringly confident now that they have wriggled past the World and European Champions, an imposing Croatia side, and an Ireland who, under Trapattoni, was supposed to give them problems. It is perhaps what was needed to lend sharp relief to Italy's slowly evolving self-realization in this tournament.